“Try this,” says Chris Hannah, sliding a cordial glass across the bar toward me. He’s done this more than once in the five years I’ve been coming to Arnaud’s French 75, a hallowed New Orleans bar that manages the trick of being at once relaxed and sophisticated. In that time, I’ve also learned Hannah is a master of the poker face; he delivers this dram to me, as he often does, without smiling or offering any acknowledgement that something curious might be afoot. Then he walks away to tend to other customers. The mystery liqueur is light, ethereal and vaguely floral. Hannah passes by a couple of times as I ask what it is. He mostly ignores me but finally hands me a wrinkled photocopy of a recipe from a 1905 New Orleans cookbook. It’s for Parfait Amour, which calls for fresh orange blossoms, among other ingredients. Hannah mentions that he couldn’t find the orange blossoms, so a few nights earlier he wandered around the Garden District surreptitiously collecting hibiscus flowers and roses, which he steeped to extract their flavors. He then combined the concoction with gin, Amer Picon and Crème Yvette in a drink he calls Flowers for Packenham. He says it’s his way of honoring the British General who died in the Battle of New Orleans in 1815. This is classic Chris Hannah. While many of today’s craft bartenders tip their hats to cocktail days gone by, Hannah seems to be dwelling in an earlier era, while regarding the present with a mild fascination. He’ll try what’s new but stick with it only if it honors yesterday. He concocts drams and syrups not to keep up with trends—it’s how he understands where he lives, both in time and place. “He seems vaguely like an international spy hiding out for a while behind a bar,” says Todd A. Price, who writes about cocktails for the New Orleans Times-Picayune. Hannah grew up with two brothers in a military family—moving around between Hawaii, Panama, San Diego, Washington, D.C., and the Virginia tidewater. He attended college in North Carolina, where he studied business administration while working occasionally as a bar back. After graduating in the late ’90s he headed to North Carolina’s Outer Banks, where he spent a season working at a bar favored by retirees and pensioners. “My first drinks were Manhattans, Stingers, Gibsons, Gimlets and Martinis,” he says. He soon transplanted to Baltimore, where he worked in the accounting department of an architecture firm and moonlighted three nights a week as a bartender in a high-end restaurant with a small bar. There, he learned about quality ingredients and serving a clientele that appreciated well-made cocktails, an experience that inspired him to quit the business world and study hospitality management at the University of New Orleans. With resumé in hand, he walked through the French Quarter, visiting every restaurant and bar that boasted an esteemed lineage. He landed a job at Arnaud’s, a local institution since 1918, where he worked the service bar for nearly two years, quickly realizing that New Orleans is a city with an idiosyncratic drinks culture, a place where uncommon cocktails are commonly enjoyed. His formal cocktail education began. Hannah soaked up all he could about classics like the Sazerac, the Brandy Crusta and the Roffignac. At one point he even realized he’d been making a classic New Orleans cocktail incorrectly when he noticed that the Absinthe Suissesse often came back unfinished by customers. Hannah delved into the cocktail’s history, corrected his recipe and customers took notice—as did Arnaud’s management. On a slow Sunday, he finally landed a shift at the adjacent French 75, an elegant bar with dark wood, small white tiles, and a surfeit of history. The bar became his permanent home, and ever since, Hannah has become the public face of the French 75, helping transform the bar program into one of the city’s best classic cocktail destinations. But behind the cool exterior is a unique brand of eccentricity. Hannah once came close to resigning over the music that his management requested he play in the bar. (They wanted down-tempo French numbers; he wanted to showcase local New Orleans musicians.) 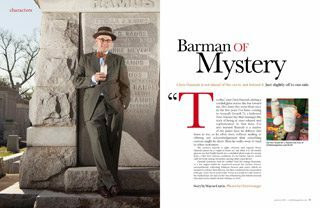 He’s the kind of history-obsessed bartender who will visit the grave of Henry Ramos—the 19th-century New Orleans bartender who invented the hallowed Ramos Gin Fizz—in his spare time. While many bartenders work hard to stand out in the competitive cocktail world, Hannah is happy to fly under the radar. (“You don’t work to get noticed,” his father once instructed him. “It’s your work that gets noticed.”) He hopes to pass along his knowledge about New Orleans drinks by working with new hires at Arnaud’s and volunteering at the Museum of the American Cocktail, where he’s often found behind the scenes. And while he likes to stay abreast of the latest trends and make sure the French 75 bar doesn’t get left behind, he does so without much fuss. “He’s like a stealthy elf,” says Berry. DIY dry vermouth gets a refreshing, vegetal makeover with this cucumber-infused formula from Portland, Ore. bartender Yoni Laos.